It is a new trend for worldwide touristic destinations, to use the technology of GPS already loaded on the mobiles of the tourists, to deliver stories thru the location aware system that is available with no data need all around the planet. Now with the GPS and the App technology tourists can download a city tour, a museum guidance, bike rides, and many other uses with their own phone. I want to share with you my stories of Bogotá (founded in 1538), the city where I was born and some of the history related to the sites where we will go in the tour. 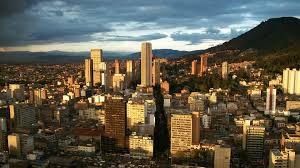 There are 3 Bogotá GPS audio-tours that will guide you by the capital of Colombia, a city where almost 10 million people lives. You can begin the GPS adventure with this Colonial Bogotá, La Candelaria tour starting at the Plaza de Bolívar; the history of my country can be told in this plaza, see the Capitolio (congress), the presidential house, Casa de Nariño, go to beautiful colonial churches, walk like a local, get to know how to walk in the altitude, check the Botero Museum, have a coffee at García Márquez Cultural Center and finish your journey at the famous Museo del Oro (The Gold Museum). You can pause if you want to or start at the moment you chose. And there are 2 more GPS Walking tours, one of them goes by Traditional Bogotá , in this tour you will know and see how a small village grew into a big a vibrant city. Know the first Spanish Language academy in the Americas, the building where García Márquez, the Nobel prize literature recipient worked as a journalist. Have a coffee or a beer at a traditional Café, walk by the Séptima the avenue where all Colombia can be seen and finish at the Modern Art Museum and the National Library. What about starting the other one at La Macarena, "La Macarena to Parque Nacional Tour" the bohemian neighborhood of Bogotá with such good restaurants to explore, go into the Torres del Parque, a beautiful red brick apartments complex building that dives into the Parque Centenario and the Centro Internacional finishing at the Parque Nacional a natural oasis in the middle of the city. More Bogotá tours are on the making. 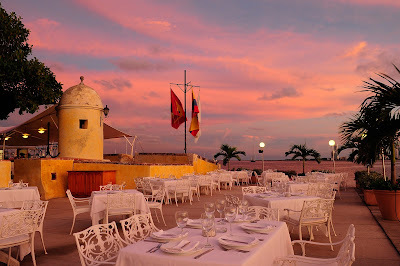 In Cartagena I have 2 tours that describe what happens and happened in the Old city and into the walls. This is the touristic gem of the country and people from all parts of the world are coming to this Caribbean destination where history, beaches, islands, nature and fun blend together. You can take the Cartagena de Indias. Into the walls of the city GPS audio-tour" where you will get into the murallas (walls) by the Torre del Reloj (Clock Tower) entrance. 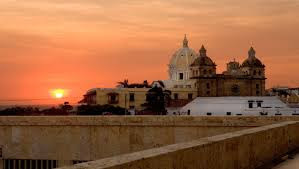 Here you are going to know how Cartagena converted into one of the richest cities of the America’s and why it was so important for the Spanish crown and for the pirates of the Caribbean. 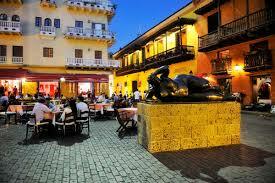 Also you will get to discover why Cartagena is the reason for Latinos to speak Spanish instead of English. Many secrets are in this colonial treasure declared World Heritage by the Unesco in 1984. There are some miracles in the way by the Saint Peter of Claver, the so called “Slave of the Slaves”. 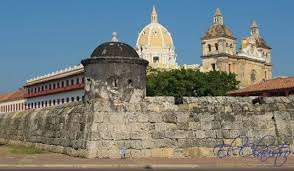 And by the other side of the walled city we start the India Catalina to Plaza Santo Domingo GPS tour from the most famous monument of Cartagena into the centro you will get to walk on the top of the walls while listening to stories and history of how the Spanish defend themselves against invaders. You will know about hotels that were convents and finish relaxing at the famous Plaza de Santo Domingo where the voluptuous sculpture of Gertudris made by Fernando Botero will give you a picture perfect opp. So you now know you can download and make the GPS walking tours at Colombia. The cost is just US $2.99 and you will support me with some funding so I can go on travelling my country to do many more. Remember that you don’t need data when doing the tour, only to do the download to your device. Please if you do the tour leave me your rating and also some comments to see what you think about GPS Touring.